Just install this App and click on “Enable Battery Percent”. Then reboot. You can uninstall the App afterwards. The setting will remain. 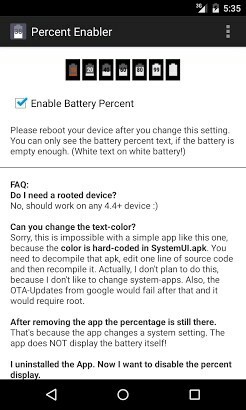 Do I need a rooted device? Can you change the text-color? Sorry, this is impossible with a simple app like this one, because the color is hard-coded in SystemUI.apk. You need to decompile that apk, edit one line of source code and then recompile it. Actually, I don’t plan to do this, because I don’t like to change system-apps. Also, the OTA-Updates from google would fail after that and it would require root. After removing the app the percentage is still there. That’s because the app changes a system setting. The app does NOT display the battery itself! I uninstalled the App. Now I want to disable the percent display. OK, just install the App again, uncheck the setting and uninstall it. This is the original App from xda-developers. Don’t accept fakes!